Gone are the days when the Christmas cheeseboard could be solved by a cursory supermarket sweep. It’s much more fun than that in 2018. Interest in British artisan cheese has soared in the last decade helped by small producers like Lynher Dairies, makers of the famously iconic nettle covered Cornish Yarg. Lynher’s new longer maturing cheese Kern was crowned Supreme Champion at the World Cheese Awards 2017 (and accolades don’t come any higher than that). With so many good delis and farm shops now on our doorsteps, award winning cheese is fast overtaking wine as the go-to festive gift. “Opening a Yarg is a special thing,” says dairy owner Catherine Mead. “The truckle itself is wrapped in locally foraged leaves. Once matured, we then package the cheese in waxed paper and nestle it in a beautifully presented box, so the joy of the reveal is important. (Note to pub quiz aficionados: It’s the backward spelling of Gray, after the farmer who first created the recipe on Bodmin Moor nearly 40 years ago). 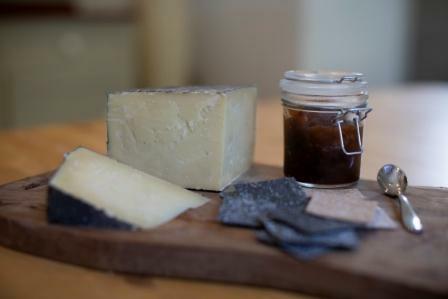 Lynher is offering three different hand-made cheeses online this Christmas (handy if you’re stuck for inspiration over what to buy the wine buff, the vegetarian, the foodie, the teetotaller etc!). Nettled Yarg hints of lemon and mushrooms, is creamy under the rind with a slight crumble to the core. Wild Garlic Yarg is firmer, gently whispering of a Cornish woodland in spring. And Lynher’s Stithians, affectionately known at the dairy as Naked Yarg, matures with a rounded flavour and a flinty texture. Order at www.lynherdairies.co.uk and the dairy will send a beautifully boxed 900gm truckle to a UK address and date of your choice.